An outstanding single-owner private collection of 20th Century Modern British Art, Fine Jewellery and Antique Furnishings assembled by the late Barbara Holliday will be sold at Sworders Fine Art Auctioneers on Tuesday 15 January 2019. The Collection includes exceptional works by leading Modern British artists, principally Dame Elisabeth Frink, Sir Cedric Morris, Sir Eduardo Paolozzi, Sir Jacob Epstein, Sir Robin Phillipson, Anthony Gross, Bernard Dunstan, Ruskin Spear, Mary Fedden and William Roberts. Highlighted among the works in The Barbara Holliday Collection is a bronze bust of Count Basie, the American jazz pianist and bandleader by Sir Eduardo Paolozzi (1924-2005) from the 1980s. With just three Count Basie busts in existence (one held by The Tate and one by The National Galleries of Scotland), the bust in Sworders' January sale is likely to be the only ever to come to market. Works by Sir Cedric Morris (1889-1982) are very much in vogue and The Red Pond, 1932, an oil on canvas comes with a provenance from British painter and sculptor Maggi Hambling CBE. Emerging from the shadows of the wooded entrance drive to The Gale sits a handsome Victorian house in the hamlet of Highlaws, a stone's throw from the Cumbrian coast. On the hottest of hot summer days in 2018, it was hard to imagine that well over fifty years ago, in the early 1960s, Ormond and Barbara Holliday were embarking on married life there. The house, then sitting in a rather sparse garden of relatively small proportions, was more usually subject to the bracing weather common in the north-west. Whilst Ormond was fully occupied running the adjacent farms, Barbara set to work on what became her great passions - her garden and furnishing The Gale. She was soon moving soil from distant parts of the farm and expanding the gardens to form the glorious array that greets one today. Formal landscaped terraces leading from one secret space to another are now populated with mature trees and shrubs, enriched by garden statuary and urns, some of which will be included in this sale. The glorious gardens could not possibly prepare you for what was to be found inside: Barbara's personal time capsule. 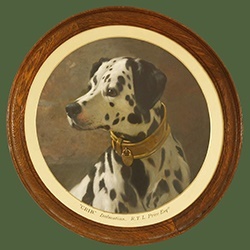 Here lay an expansive collection of Georgian and Victorian furniture, paintings, ceramics, silver and jewellery alongside commissions of beautiful lampshades and cushions. A much more cosmopolitan taste than you would expect to find well over three hundred miles from London. From the early 1970s, Barbara had been scouring the auction rooms on regular trips to London and the provinces, picking up treasures on almost every excursion. As London visits became more frequent, staying at The Farmer's Club was less attractive, so soon they bought a pied-à-terre overlooking the Chelsea Arts Club, which of course needed furnishing too! From the late 1960s, Barbara had been a close friend of local born artist, Sheila Fell. Although Fell had both trained and lived in London, she painted mostly scenes from her birthplace in Cumbria. She was, by then, a significant talent, having been given her first solo show, at the age of only twenty-four, at the Beaux Arts Gallery in London's Bond Street in 1955 and soon afterwards joined the teaching staff of Chelsea School of Art. Fell won many awards and was elected an RA in the mid-seventies, enthusing Barbara who became a passionate collector of contemporary art and sculpture, particularly by Royal Academicians, whose company she enjoyed through her membership at the academy. Sheila's early death in 1979, aged forty-eight, didn't deter Barbara; if anything she became even more enthusiastic as a collector. She enjoyed buying direct from her artist friends. Olwyn Bowey and Carel Weight in particular became close family friends, making long trips to The Gale to paint and guiding Barbara in her collecting. Works by these two artists feature prominently in the collection. Barbara was instrumental in arranging the major Carel Weight exhibition at Abbott Hall in Kendall, 'Carel Weight, Anne McEntengart: Paintings', in early 1986 and, of course, in Olwyn she found someone who was dedicated to the tradition of the artist plantsman. Through them she met and bought works by several of the significant Academicians of the late 20th century. Among them, Dame Elisabeth Frink, Sir Jacob Epstein, Sir Robin Phillipson, Anthony Gross, Bernard Dunstan, Ruskin Spear, Mary Fedden and William Roberts. Late in his life she formed a friendship with Sir Eduardo Paolozzi, from whom she bought his magnificent bronze 'Count Basie' and by whom she was gifted several plaster sculptures. Barbara Holliday lived in the era of the hand written letter and delighted in writing to her artist friends. Those paintings and sculptures which have letters directly relating to them are being sold with the original correspondence. Both sons Johnny & Mark who grew up at The Gale, loved visiting the family home with the grandchildren, occasionally coinciding with visits from Carel Weight, who would enjoy giving them sketches of the farm and it’s surrounds. On each visit they would see how the collection had progressed. Mark and his family have made their life in Africa, and Johnny, with a career in aviation, travels extensively from his base in the east midlands so does not have a home that could house this extensive collection. Having chosen a few personal items to keep, it is with a mixture of sadness and pride that they offer their mother’s diverse and fascinating collection for sale. The collection will go under the hammer at Sworders Fine Art Auctioneers on Tuesday 15 January 2019. We are currently accepting further entries of Modern British Art for a subsequent auction in 2019 - closing date Friday 11 January 2019. Sworders are pleased to offer a complimentary online valuation service. Simply fill out the form and press the 'Submit' button below. You will hear from an appropriate valuer as soon as possible. Prudence is an auctioneer and jewellery valuer at the Stansted Auction rooms and Head of the Designer Handbags and Couture department. She has a BA Honours in Historical Fashion and Costume and a Gemology Diploma from The Gemological Association of Great Britain. During her time working in the industry she has built up an extensive knowledge in fine and decorative arts.